Let it never be said that Nik Turner is mellowing with old age. From his relentless touring, to his dozens of guest appearances on other people’s albums, to this, his latest solo album, the 73 year old shows no signs of slowing down. Space Gypsy is simply just brimming over with a remarkable vitality, and Nik’s dynamism can be heard coming through, on every track. But a good part of this amazing energy can also be attributed to Nik’s choice of members for his band. Rather than drawing on the spacerock collective as he’s done before, this time out Nik hand-picked musicians from the punk and industrial scene. Along for the ride are UK Subs co-founder Nicky Garratt on guitar and his Subs band mate Jason Willer on drums. On bass is Jeff Pitchinini, (AKA Geoff Myles), from early punk rock band Chelsea. Rounding out the group is Jürgen Engler, front man of the excellent German industrial band Die Krupps, on guitar, Moog synths and Mellotron. Engler also produces the album. But despite the backgrounds of the band members, make no mistake, Space Gypsy is not a punk or industrial album, it is pure SPACEROCK, but highly infused with the energy of those genres. Nik is in fine form whether squonking away on his sax on the rockers, or taking some lovely melodic turns on both sax and flute on the mellower cuts. It’s great to hear all those crazy and wonderful sounds he developed in his Hawkwind days again, but Nik is a much better player now than he was back then. After years of honing his skills on his own solo works and on collaborations with others, the Nik Turner of today has an amazing range, from heavy rock n’ roll sax blowing to wild free jazz freakouts (check out the final minute of We Ride the Timewinds) to deliciously melodic pop-style sax hooks like those on the track Anti-Matter. He also does some absolutely gorgeous flute playing on some of the mellower tracks like the softer Galaxy Rise (reminding me a bit of The Demented Man with its seagull cries, acoustic guitar picking and stately Mellotron) and especially on the almost album closer, the epic The Visitor. Vocally he’s also in fine form, whether he’s playing the detached, lost astronaut of the superbly rocking opening cut Fallen Angel STS-SI-L or the paranoid punk of the bonus track Something’s Not Right or story-telling on the darkly psychedelic epic The Coming of the Maya. The rest of his band is a knockout too. One time punker Nicky Garrett is just as comfortable pummelling out the heavy electric riffs as he is strumming and picking the acoustic guitar. Willer and Pitchinini make for a top notch rhythm section that are as tight or as loose as Nik needs them to be, and Engler piles on the sweeping Mellotron chords and cosmic swathes of Moog electronics with reckless abandon, upping the cosmic quotient considerably. Nik’s former Hawkmate Simon House also contributes stunning violin to a couple of the tracks and erstwhile (and perhaps future) spacerocker Steve Hillage makes an appearance as well. Of course, all the great playing in the world wouldn’t make any difference if the songs weren’t good. Are they? You bet they are! Everyone in the band has at least one writing credit, with many of the members, including Nik himself, with several credits. It’s clear that Nik has tapped into a great pool of talent here as these are some of the best spacerock songs to come out from any former or current member of Hawkwind in quite some time. They are just bubbling over with memorable riffs, catchy melodic hooks, and stunning psychedelic explorations. Engler’s production is also superb, giving the album just the right amount of sheen without overdoing it, letting all the instruments breathe and come alive. 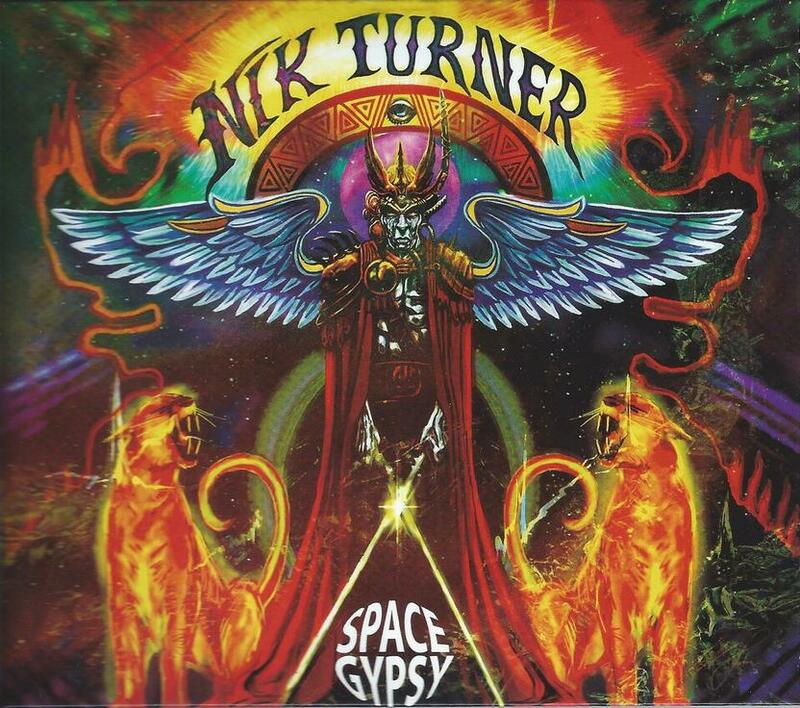 There is no doubt in my mind that Space Gypsy will be high on my top 10 albums of 2013. Highly recommended for spacerock fans everywhere!